Back Row (L to R) : Stevie Dugdale, Nathan Christensen, Andy Syme, Monte Knepper, Bart Buell, Bob Arnold,, Mason Lee, Rick Gabbitas, Greg Duerden, Ron Andrews, David Castelli; (kneeling) Don Allen; Strawberry Days Royal Court: (back row) Jaycee Carter, 2nd Attendant Rodeo Royalty, Grace Green, 1st Attendant Rodeo Royalty, Hanna Holmes, Little Miss Strawberry Days royal Court, Mckell Wall, Rodeo Queen; (front row) McKell Haynie, Natalie Wimmer, Haylee Scott, Lucy Weight, all Little Miss Strawberry Days Royal Court. Photo taken Sunday, June 17, at Pleasant Grove Rec. Center Community Concert. 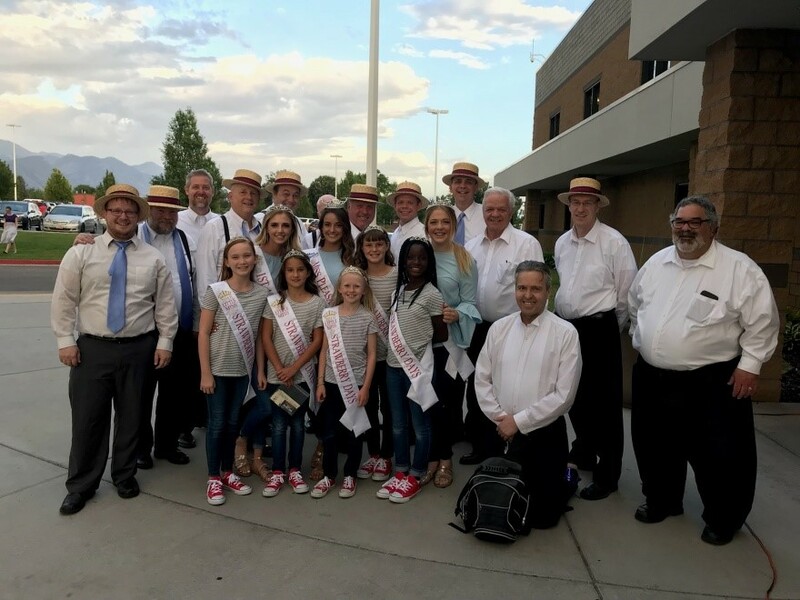 Utah Valley Skyline Barbershop Chorus Chapter has performed on or near Father’s Day at the Pleasant Grove Recreation Center’s Community Summer Concert Series for the past four years. It has become a regular event for the Chapter and the Community. This year the Community Concert coincided with the annual Strawberry Days Celebration and Rodeo in Pleasant Grove. During the Community Concert the Royal Court of the Strawberry Days showed up. Just after the concert the Chapter and the Royalty took a photo together. Our director, Stevie Dugdale, tried something new this year. He asked for two volunteers from the audience to each choose a tenor, a lead, a bass and a baritone to sing as an impromptu quartet. One quartet sang half of “Heart of My Heart,” and then the other quartet sang the last half. The audience voted, by applause, which quartet was the winner and the two volunteers from the audience received gift cards to a local Willaby’s Restaurant. Everybody won!! It was a good night and both the audience and the Utah Valley Chapter enjoyed the event!